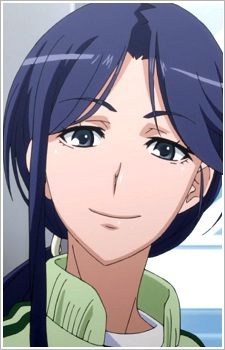 Yomikawa Aiho is a teacher at Touma's school and a friend of Komoe. She is beautiful, has glamorous proportions, and is always seen with a green jersey and often ends her sentences with "-jan." Despite having a glamorous figure, she acts in a tomboyish manner and regularly joins her colleague Tsukuyomi Komoe in drinking sessions after their work. She is always teasing Komoe. She is a member of Anti-Skill and cares deeply for her students (in spite of having a "spartan" approach in teaching according to Komoe), and is an active peacekeeper within Academy City. Due to her habit of ramming delinquents with protective items like shields or helmets to resolve incidents, saying it's alright to do so since those are protective items, she's known as "the woman who uses comedy-like methods to solve problems that could end up as a tragedy." Yomikawa suspects that Accelerator is involved in Academy City's dark side, which he does not deny, but instead calls Yomikawa naive for thinking the things that barely scratch the surface are the worst that things can get. Later she brought Accelerator back out of the dark side briefly, before he got dragged back by Kakine and got herself stabbed by Dark Matter.